Day bed is reversible, so you can use it with the shelf on the left or right. We all need layovers - tiny, instant doses of comfort. Be it for a few minutes on a busy day or couple of hours on a lazy afternoon, we need some cozy and inviting place to shut our eyes for a second, take a nap or focus on an important call. Casual, accessible, yet pleasantly secluded. For those places, we've designed NAPKA - the daydreaming day bed. 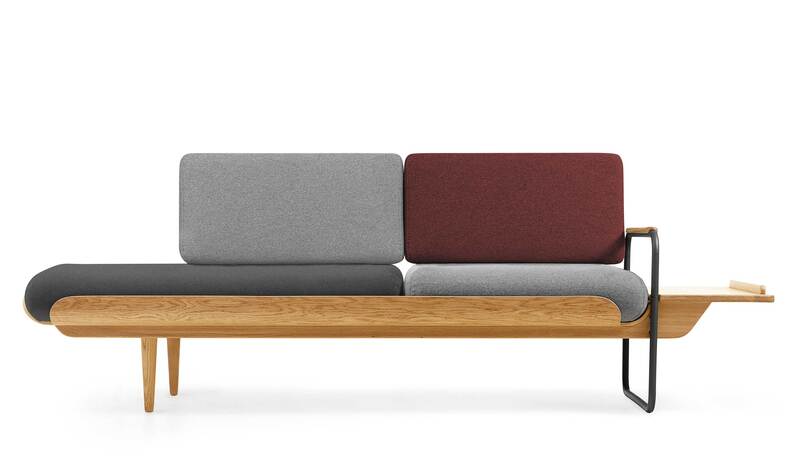 NAPKA is multifunctional - it will fit into a living room, cabinet, guest room or waiting room just as perfectly. Its construction, made of oak, steel and bent plywood, carries four comfy cushions, that you can arrange as it suits you. Remove the armrest, then put the headrest and you'll get a nice place to rest. Expecting company? NAPKA offers a great place to seat for several people. Once the guests are gone, all it takes is a couple of moves and you can lay down all you want. We were inspired by the classic day beds of the 70s. This is where NAPKA took from its unconventional shape - well-formed and balanced, yet carelessly unsymmetrical. Rich textures add depth and tension to the toned upholstery. We prefer NAPKA in graphite black, but if the grey-scale is not your style, you can pick either the red wine or indigo blue version.